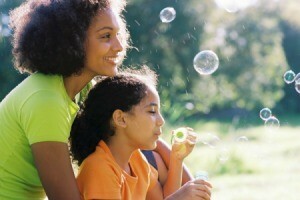 Simple soap bubbles are inexpensive and can amuse all ages of children. This is a guide about frugal fun with bubbles. Bubbles are among the oldest and most popular of children's playthings. Even when families have no money for toys, they can usually find a wire to twist into a circle and some soap suds. And bubbles make people smile, whether they're watching, blowing, popping, trying to catch, or singing about them. National Bubble Week then (this year from March 11-17), is a time for kids (and pets) of all ages to celebrate the fun and entertainment of bubbles and to usher in the first day of spring. There are professional bubble blowers, E-Cards, books, paintings, bubblefests, even a Bubble Blower's Museum, which further spotlight these "minimal surface structures" (as bubble-ologists would call them). And then there are the Guinness World Records for the biggest bubble (big enough to surround an 8,000 pound elephant; 19 boys and girls), the largest free floating bubble, the longest bubble, the most people simultaneously blowing bubbles, and the most bubbles blown with a live tarantula in someone's mouth. "The best bottles of bubbles one can buy, it seems, are from Gymboree," said a friend. "Their bubbles (made from sugar, not soap) stay on the ground and on kids long enough for them to have a chance to pop them. You can even stack them on top of one another. I've found them the next day (sometimes several days later) sticking to the carpet, the walls, picture frames, everywhere." Of course, making the solution at home is fine too, and cheaper. The most common recipe appears to be: one cup of Joy (or Dawn), eight cups of soft or distilled water, and 1/4 cup of glycerin or White Karo Syrup. Another recipe for Super Bubbles is two parts dishwashing gel, four parts glycerin, and one part white corn syrup (no water). For a Bouncy Bubble Solution, try one package unflavored gelatin (Knox), one cup of just boiled hot water (in which to dissolve the gelatin), 70 ml of glycerin, and 250 ml of Johnson's Baby Shampoo. For all of these, the solutions should be left to blend overnight before using. Homemade wands work, as well. Consider taping six drinking straws together for lots of little bubbles; or use pipe cleaners, plastic rings that hold six-packs, or coat hangers for even larger bubbles. Enjoy making bubbles within bubbles or square bubbles, and bouncing, floating, or mega bubbles. And finally, besides blowing bubbles with my grandchildren and the neighborhood gang, I like to take a container or two along on vacations. I've found that most youngsters are just happy to be smiled at and acknowledged, but if I blow them some bubbles, better yet, let them do it, they're ecstatic. Notice for example, the expressions on the faces of these young people from somewhere in rural Morocco. I don't think they had ever done that before, even though their mothers were nearby, washing clothes in the stream. Thanks! My granddaughter goes to Gymboree and they sell the bubbles there. Now I can make them for her.